The following automation scripts for the Cross-References are available free of charge upon request. 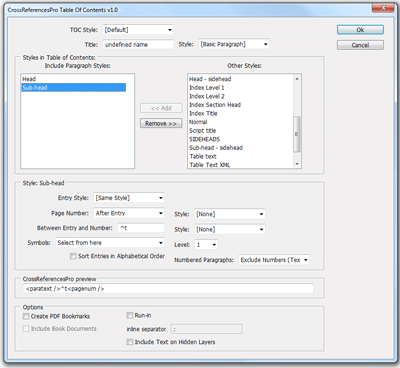 Creates Table of contents in a similar way that InDesign does, but with Cross-References PRO, updating chapter names and page numbers in real time. Replaces the index entries with Cross-References PRO, updating page numbers in real time. 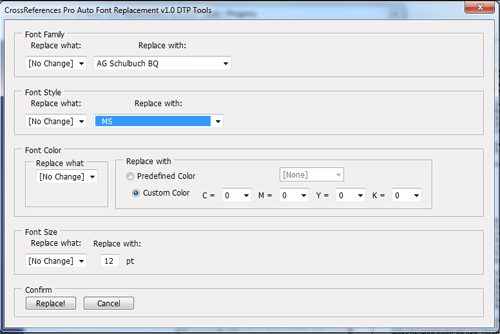 Searches for fonts, font styles, colors in Cross-References PRO format definitions and replaces with the font. 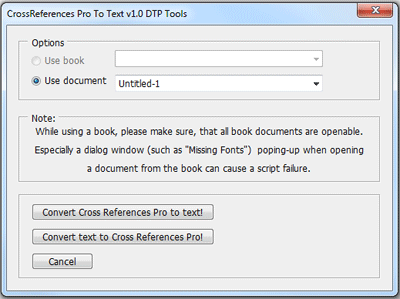 To protect the cross-references pro data in your documents when using translation software or sending just the text for translatinon or editing, convert your references to a text code before the text leaves InDesign. After re-importing you can re-create all references automatically by running the script again. Analyze the document based on user set cross-referencing pattern and automatically create cross-references. 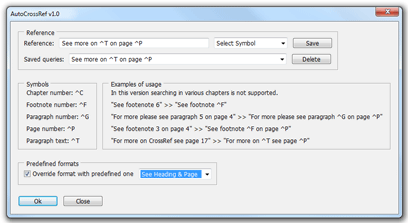 Quickly create a cross-reference by choosing an existing text anchor and cross-reference format. We recommend assigning a keyboard shortuct to this command to meke it more efficient. This sample script creates new document with the list of all cross-references in active document. This sample script creates new document with list of invalid/unresolved cross-references in active document. This sample script creates new document with the list of all cross-references in active book. This sample script creates new document with list of invalid/unresolved cross-references in active book. This sample script demonstrates how to add new cross-reference formats to active document. This sample script creates new document with list of all cross-reference formats in active document. This sample script creates new document with list of all source markers in active document. Open the document to review available formats. Close all documents and choose "Load Formats" in Cross-References menu and select one of the following documents to load formats into your workspace.